Summer is a great time for children to take advantage of the often slower pace to build their reading skills. It's not always easy to pry kids from their screens, but there are some excellent resources that can help children grow a love of reading that will last well beyond their school vacation. Once place to begin is with a summer reading initiative from Reading Rockets, called Start with a Book. 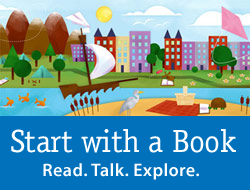 Start with a Book allows kids and parents to start with a topic -- music, inventions, science, and many more -- and suggests books at an appropriate level for kids of all ages. The website also contains tips on the importance of reading aloud, how to build a home library, and how to get kids hooked on reading, during the summer and all year 'round. Closer to home, here in New York City, the Brooklyn Public Library, New York Public Library, and Queens Library all have summer reading programs for kids. The Brooklyn Library program kicks off this coming weekend with activities in all branches. There are also book lists for all ages, as well as challenge contests. The Queens Library has its kick off event tomorrow, at branch libraries throughout the borough. And the New York City Library has a guide to summer reading, with book lists for all ages. Help your child find a book and make summer more fun while building skills for the next school year.